Pretty vintage West German silver and brass Aurora Borealis Crystal beaded Extending Clasp. Amazing vintage 1930's faceted flat foilback oval opal rhinestone as pendant. 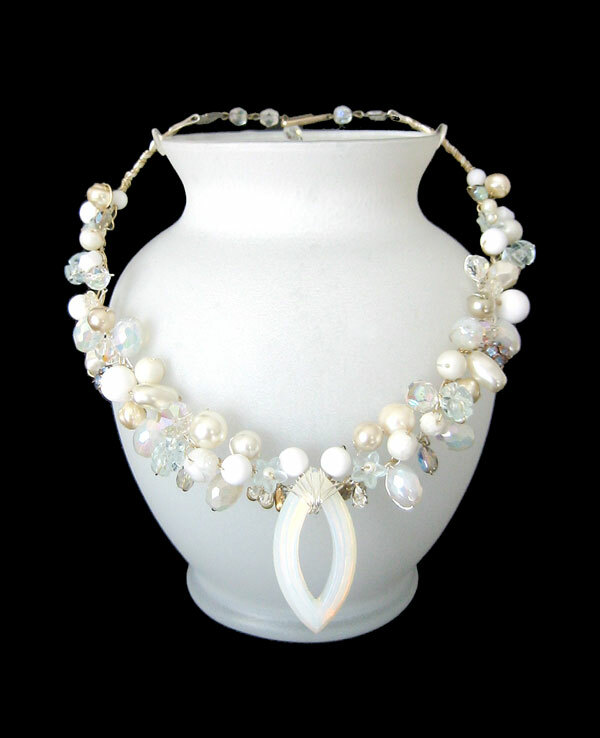 Vintage opalescent milk glass faceted ovals (8). Vintage German Lucite pale blue 'carved' ovals (4). A variety of vintage Swarovski Aurora Borealis Crystals. Tiny vintage frosted Lucite flowers (2). Vintage "Trifari" white bi-cone beads (2). Vintage West German pale blue Lucite flowers (4). Vintage Light Sapphire Swarovski Rhinestone 'Flapper' beads (2). Tiny vintage Swarovski Rhinestone teardrops (6). A variety of vintage white rounds.